Stepping aboard the U. S. Coast Guard Cutter Healy to explore the Arctic Ocean, Carin Ashjian expected to ride the sea’s winds and swells, but not an emotional roller coaster. In spring and summer of 2004, Ashjian and colleagues were investigating the potential impacts of a warming climate on the delicately balanced Arctic Ocean ecosystem, when they discovered an unexpected phenomenon: nine sightings of baby walruses swimming alone far from shore—apparently abandoned by their nursing mothers. “The young can’t forage for themselves and are dependent on their mothers’ milk for up to two years,” said Ashjian, a biologist at Woods Hole Oceanographic Institution. 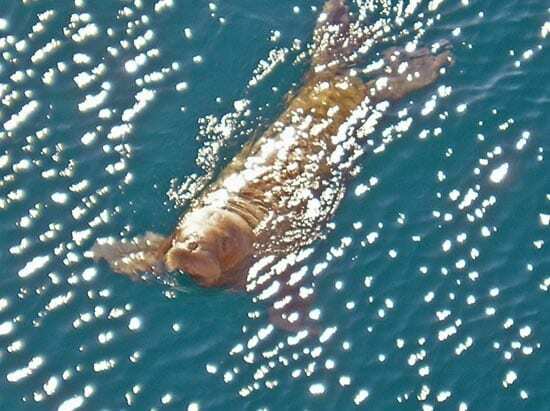 The lone calves, about two months old and too far offshore to swim back to land, would likely succumb to starvation and drowning, the researchers concluded. Adult walruses forage for clams, snails, crabs, worms, and other invertebrate animals on the shallow seafloor of the continental shelf, diving to depths of no more than 656 feet (200 meters). Walrus mothers leave their calves on sea ice while they dive, returning to nurse them. In short, walruses depend on sea ice that usually persists above shallow nearshore waters in summers, and in 2004, the ice disappeared. 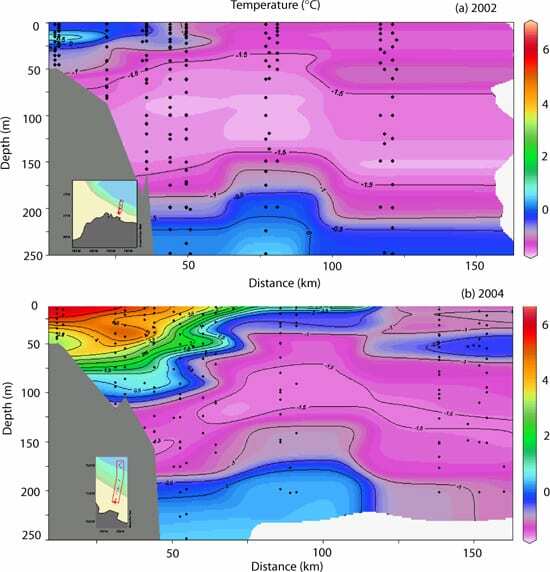 The researchers observed a mass of water as warm as 44°F (7°C) over the continental shelves of the Chukchi and Beaufort Seas—more than six degrees higher than temperatures measured in the same region in 2002. Sampling with plankton nets, they found zooplankton species characteristic of warmer, more southern waters. 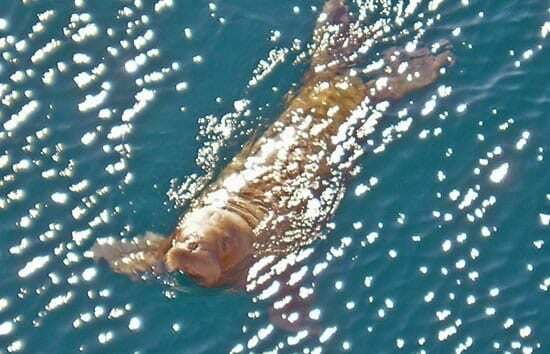 The scientists reported their findings in the April 2006 issue of Aquatic Mammals. Lee W. Cooper, a biogeochemist at the University of Tennessee, was lead author of the report, which concluded that warmer water came north into the Chukchi and Beaufort Seas, melting nearshore sea ice or moving it further north. That left the only remaining ice far offshore and over the deep water. The researchers think that the mothers had to swim farther and farther from shore to find ice for the calves to rest on and eventually had to abandon them in waters too deep for the mothers to reach food. Ice was “virtually absent” throughout the area where the scientists saw the lone calves. The area was 53 to 134 miles (85 to 215 kilometers) from shore in water 9,842 feet (3,000 meters) deep. 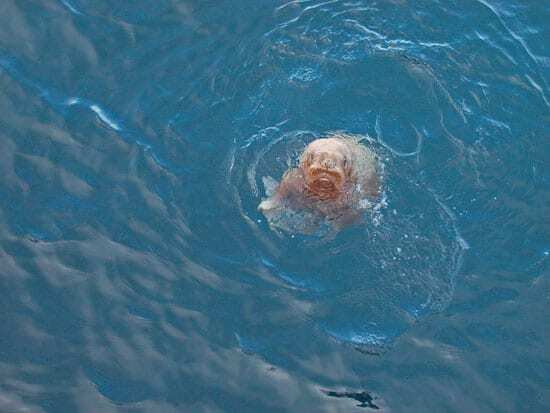 The researchers saw mothers and calves together only in water less than 328 feet (100 meters) deep and 20.5 miles (33 kilometers) from shore. 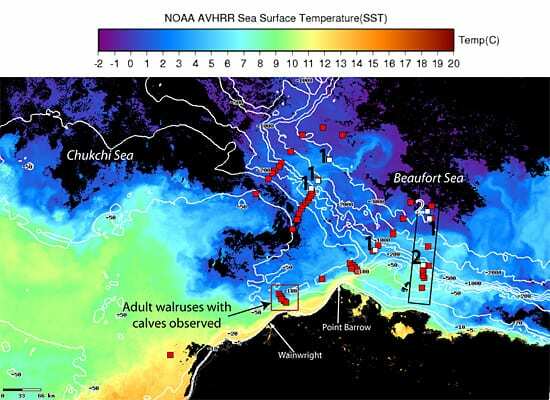 “If walruses and other ice-associated marine mammals cannot adapt to caring for their young in shallow waters without sea ice available as a resting platform between dives to the seafloor, a significant population decline of this species could occur,” the scientists wrote. When the Healy appeared in the ice-free waters, the calves were drawn to it. The Marine Mammal Protection Act of 1972 prohibits the capture or removal of any marine mammals in U.S. waters and by U.S. citizens on the high seas—and there was no place they could have taken the still-suckling calves. The National Science Foundation and the Office of Naval Research funded the research. Also participating in the study were Sharon L. Smith from the Rosenstiel School of Marine and Atmospheric Sciences at the University of Miami, Louis A. Codispoti of the University of Maryland Center for Environmental Science, Jaqueline M. Grebmeier of the University of Tennessee; Robert G. Campbell of the University of Rhode Island Graduate School or Oceanography, and Evelyn B. Sherr of the College of Oceanographic and Atmospheric Sciences at Oregon State University. Arctic Research Consortium of the U. S.
What Brings the Food that Brings the Whales?